And yet on May 8, EWG’s Senior Vice President of Government Affairs Scott Faber moderated a conference call between the ag press and Daren Bakst, the senior ag policy research fellow at Heritage, and four other spokespeople for decidedly libertarian or conservative groups to slam the House Ag Committee’s 2018 Farm Bill written mostly by Committee Chairman Mike Conaway. Remarkably, these born allies of the House Republican majority took cannon shots at the controversial bill Conaway says he intends to muscle through the House the same way he pushed it through the Committee—without one Democratic vote. 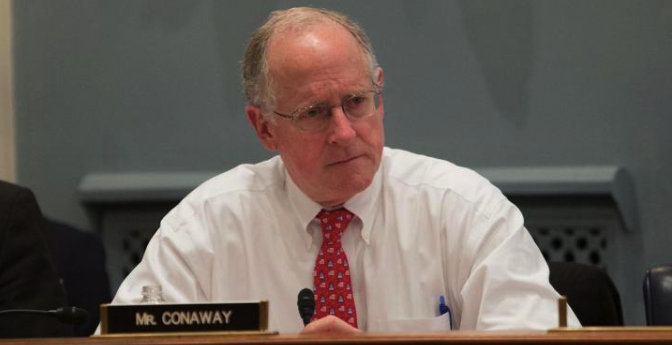 Unlike that hyper-partisan effort, however, Conaway faces hardened conservative GOP opposition to the bill. Many see its loosening of program participation rules, elimination of any meaningful payment cap, and continued reliance on heavily subsidized crop insurance as three deadly sins that need immediate atonement. Here’s how the May 8 participants, fiscal hawks all, view Conaway’s Farm Bill. –Government protection for crops like sugar, extolls Nan Swift, director of federal affairs at the National Taxpayers Union, are “failed Soviet experiments” that should not be part of any “free market” Farm Bill. –The bill’s key component, crop insurance, opines Caroline Kitchens of the R Street Institute, a libertarian think tank, is rife with “waste and cronyism” and needs “payment limits, means testing,” and a deep cut of “at least 15 percent” to the 62-percent taxpayer subsidy now received by program participants. –Additionally, offers Heritage’s Daren Bakst, “The 2018 Farm Bill is worse than the status quo. It creates more loopholes, gives more subsidies to folks who have no business receiving them… and creates programs like the new cottonseed” one that will again cost American taxpayers when “our trading partners” win their trade objections. With critics like these, House Democrats may want to just lock their jaws and let their Republican colleagues talk the Conaway bill to death. Some did suggest, however, that the bill could be fixed through the amendment process on the House floor. That’s a tall order because the House leadership—principally Speaker Paul Ryan—will keep a tight grip on which amendments see daylight to both limit the bill’s overall cost and retain its controversial SNAP, or food stamp, rule changes. Either way, Conaway claims he’ll introduce the bill the week of May 13. Whether it moves forward depends on simple math: if he has the votes to pass it, a floor vote will be held. If not, the bill stays in his pocket. This time around, however, no one in the Senate wants to touch the Conaway bill “because, basically, it’s Paul Ryan’s welfare reform bill, not a Farm Bill.” That’s a problem in the Senate because both its Ag Committee leaders have made it plain neither will overhaul SNAP in their bill. Besides, Paul Ryan is a lame duck; he’s headed out the door at the end of the session. With him, guesses the handicapper, goes the 2018 Farm Bill. If so, this Congress’s tombstone should read: Here lie the winning losers; even their friends thought they were knuckleheads.